BEST HDMI Cable 2m HDMI (High-Definition Multimedia Interface) is a compact audio/video interface for transmitting uncompressed digital data. It represents a digital alternative to consumer analog standards such as Radio Frequency (RF) coaxial cable, composite video, S-Video, SCART, component video, D-Terminal, and VGA. HDMI connects digital audio/video sources such as set-top boxes, Blu-ray Disc players, personal computers (PCs), video game consoles, and AV receivers to compatible digital audio devices, computer monitors, and digital televisions. Use this fully compatible cable to connect your digital devices to a high definition display via the HDMI port Product Features: •Supports resolutions of 1080p, ‘deep colour’ (12Bit), 60Hz refresh rate, 10Gbs Transfer rate. •Supports Dolby TrueHD and DTS-HD, 7.1 lossless Digital surround sound. 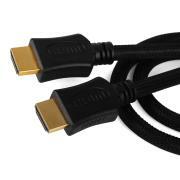 •Gold plated plugs for enhanced sound/picture quality •Male to Male Cable For Use With PS3, TV, DVD Players etc.